Carterville is a city in Williamson County, Illinois, in the United States and is geographically situated between Carbondale, Illinois and Marion, Illinois. The city is located next to Crab Orchard National Wildlife Refuge. As of the 2010 census, the city population was 5,496. The city is part of the Carbondale-Marion combined statistical area and city has grown considerably as a residential community of Carbondale and Marion. Carterville is home to John A. Logan College, named for the local American Civil War hero and politician John A. Logan. A college of approximately 8,000 students, John A. Logan College has been featured in Rolling Stone Magazine as the nation's fifth best community college and in 2004 was recognized as one of the fastest growing community colleges in the nation. 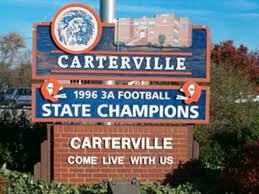 Carterville High School was recently recognized by the Chicago Sun Times as one of the top 50 high schools in Illinois. Reading and math results from the 2012 Prairie State Achievement Examinations (PSAE) were used to determine the rankings. Overall, CHS ranked 29th and is company of the best high schools in Illinois.